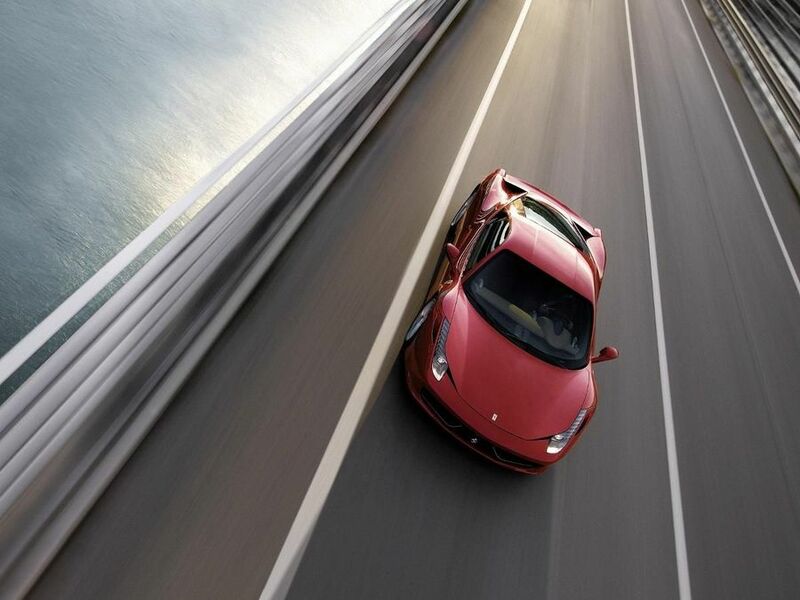 There is no question that the Ferrari 458 Italia sets the new benchmark for the class. Interested in buying a Ferrari 458? Ferrari’s traditional large and circular tail-lights are there, but much of the 458’s shape is down to aerodynamics – the wings in the front grille even change shape at speed to reduce drag – meaning it looks great from some angles and slightly odd from others. Form follows function and that’s fair enough with Ferrari’s race history where speed is what matters. It’s not without a little anxiety that you flip the door catch and slide into the 458’s body-hugging seat. Many of the controls are on the steering wheel. It’s the most complicated wheel fitted in a road Ferrari, though there is nothing like the 24 buttons and switches of its F1 cars. The 458 is only offered with a Getrag seven-speed dual-clutch gearbox which works either as a full automatic or at the behest of the driver by pulling paddles behind the steering wheel. There is no manual option. Space and practicality probably aren’t the biggest concerns of anyone shopping for a two-seat supercar. However, driver and passenger both get plenty of head and legroom, and there’s space behind the seats to supplement the deep but narrow front storage area. One of the 458’s switches, the ‘Manettino’ as Ferrari calls it, offers the latest thinking for the car’s amazingly complex electronics and decides how much the stability and traction systems and electronic differential ‘talk’ to each other if you use the enormous power. Somewhat oddly ‘Race’ is our preferred setting for the road rather the ‘Sport’. It allows the car to move about a bit more, which means the tail can edge out before the systems start to help the driver. At only two turns lock-to-lock the steering is quick without being nervous. The 4.5-litre V8 is ready to force 562bhp – more than three times the power of a Mini Cooper S – through the back wheels. The fantastic engine screams round to 9,000rpm and the noise is amazing. It sounds like a Ferrari F1 car but with the volume turned down to ten. Click the right-hand ‘up’ paddle and you’re in another gear quicker than you can blink as the relentless acceleration and noise continues. Use the launch control system and 0-62mph takes a claimed 3.4s, while top speed is 202mph. Nobody buys a Ferrari expecting cheap running costs, but the 458 is more economical and emits less than the F430 it replaces. Official figures promise 20.6mpg on the combined cycle, although you are more likely to see 14mpg around town. Carbon dioxide emissions of 307g/km won’t win any green awards, but that’s a drop of 113g/km compared with the F430 when it was launched. The 458 looks and feels like a quality product that’s made to last. Italian exotics have a reputation for being fragile that’s not entirely deserved. Use the car regularly rather than leave it tucked away in the garage and it should prove reliable. The versatile traction control and stability system allows the driver to tailor the degree of electronic assistance depending on the weather and how brave (or foolhardy) they feel. If the worst happens, the car’s airbags and stiff aluminium skeleton will do their best to protect you from harm. Don’t expect goodies like sat-nav and cruise control as standard. The Ferrari doesn’t have a long list of toys, but then it doesn’t need them: it is the toy. Compared to the brilliant 430 Scuderia, the 458 feels next generation. The 458 is less raw and more refined.